For quite sometime now I have been wanting to create a family menu board so that Matt and I can write down what we plan out for a specific weeks dinner menu and be able to remember it some place other then in our heads. As I am sure you can imagine, keeping track of how you mean to use your groceries for a whole week can be rather difficult when you are relying on your own brainpower to do so. We also thought it would be a fun way to keep us engaged and looking forward to that special meal we share together every night right now in the present as well as in the future once our family begins to expand. The only problem is I am a bit picky when it comes to crafting things as well as really thrifty with our finances. I had seen a lot of cute ideas on Pinterest but none of them quite fit the bill for what I was dreaming up. They were either really cute, but not functional enough, or really functional, but not cute enough! Isn’t that how life seems to work sometimes? If you rush into things you end up settling for one need versus another, but patience will always take home the prize! Thankfully I was patient and decided not to settle for a quick fix, but instead waited it out in the long hall. Last, summer Matt and I were living in Lexington. The street we were living on held a collection of old homes and on my way home from nannying one day I just happened to notice that one of the homes being remodeled was getting a full set of brand new windows, which meant I had hit the goldmine of old vintage ones! I asked the owners if they would mind me taking them and of course they were happy to feed my crafting addiction since that meant they didn’t have to worry about the trash collection picking them up etc. After some deliberation about what I should do with them, I decided to use one of them to make a family dinner menu board. So here it is. 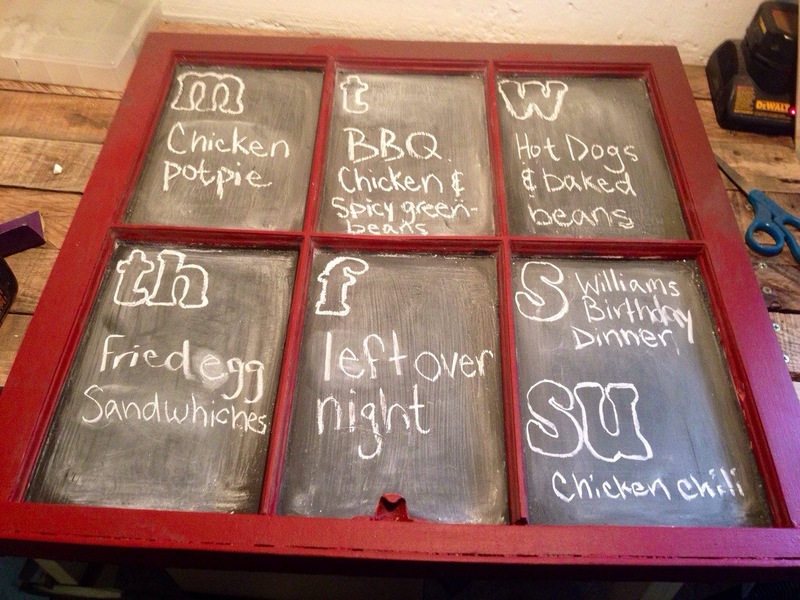 How I was able to take an old vintage window and up-cycle it into a family menu board! Set up your work space. Make sure that the drop clothe is covering all surfaces of space that you want to keep clean. Begin by cleaning off window panes with glass cleaner and any dirt or debris off of the windows wooden frame. The begin before it was transformed! 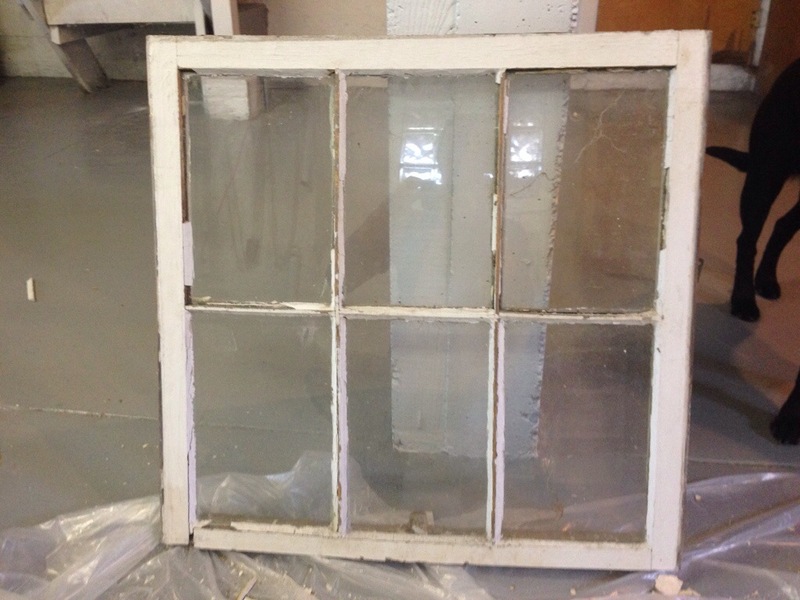 Use the masking tape to tape the edges of the paned glass, so that the stripper does not destroy the glass. I found out later that this is not necessary, but it’s still a good idea. Getting ready to begin stripping! Put on your gloves so that you do not get any stripper on your hands. Shake the chemical stripper well and pour it into the metal tray. Using the cheap sponges brush the stripper onto the wooden frame. Make sure to only go in one direction. Allow it to sit for the amount directed on the instructions. For me this was 30 minutes. 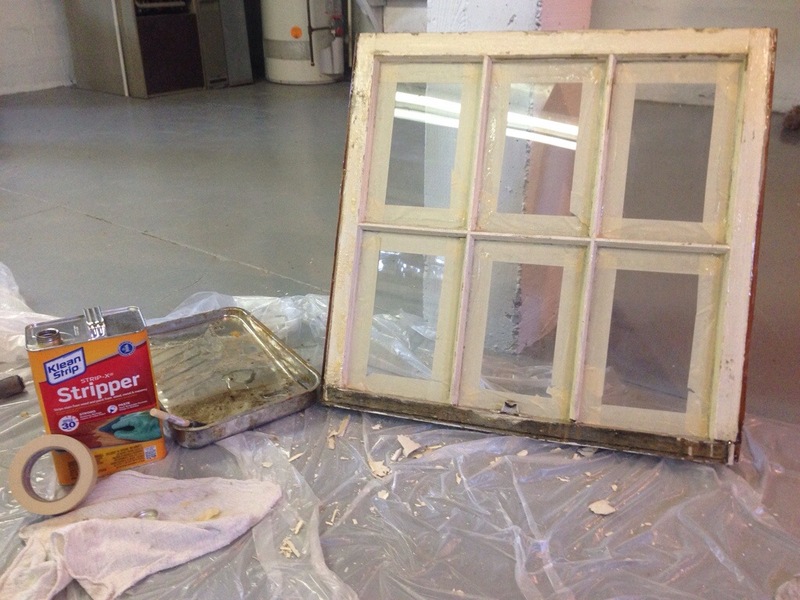 Using the paint stripping tool, strip the paint off of the window frame in a downward motion. Repeat the chemical stripping process (steps 4-6) until the window frame is almost completely clear of all paint residue. 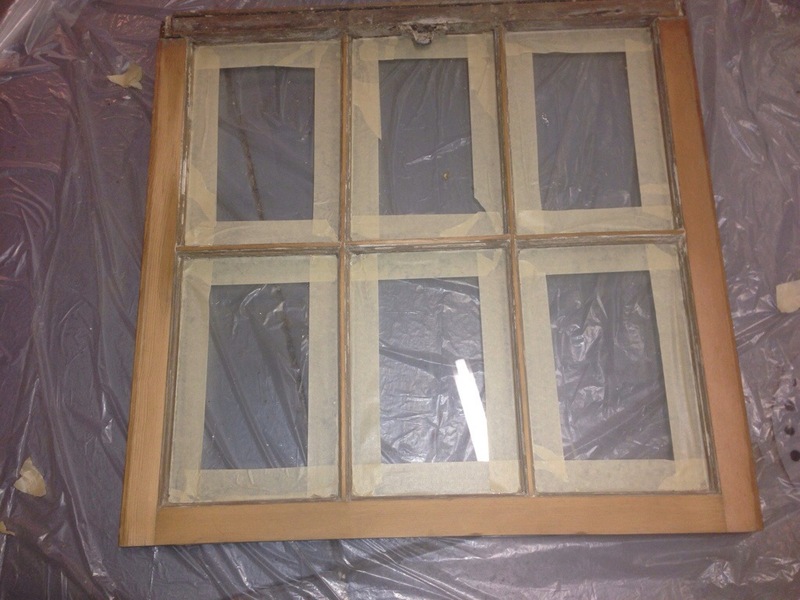 Peal the masking tape off of the window panes and repeat this process (steps 1-8) on the opposite side of the window. All finished with the first phase! Next take the sander and sand paper and sand the windows wooden frame until it is smooth. 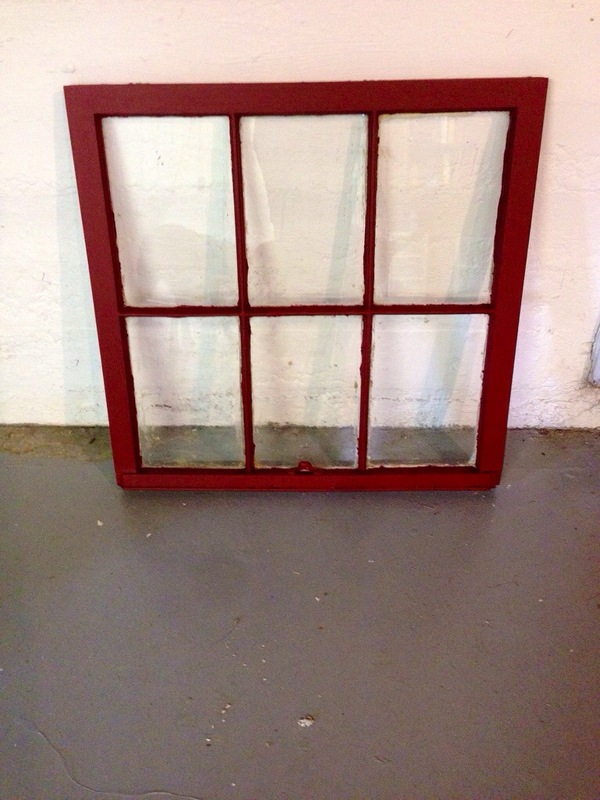 Side note you will have to sand the inside of the panes by hand. 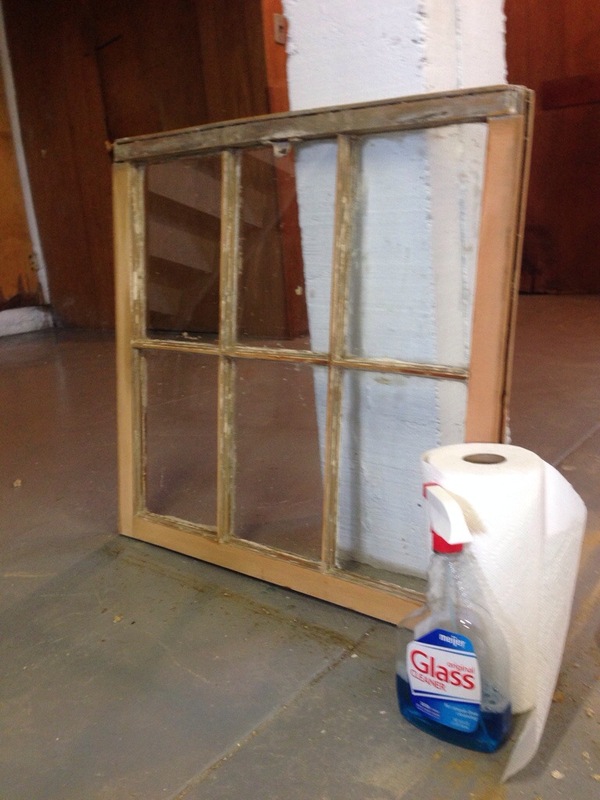 Once again, using the paper towels and glass cleaner, clean the window panes of any chemical stripper or paint residue. 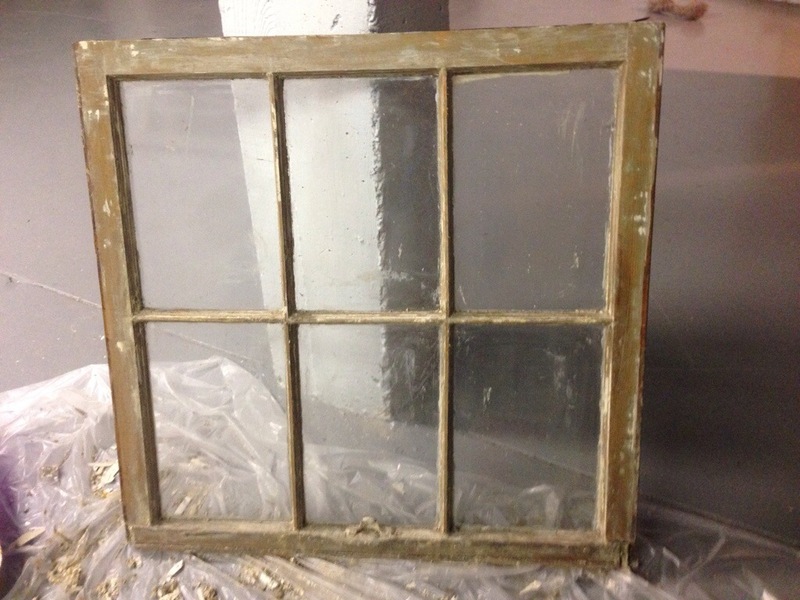 Now take the masking tape and secure the inside of the window, creating a barrier between the frame and the glass. This will ensure that paint does not leak through onto the glass panes. Mix up your paint and, using the thicker paint brush, cover the entire frame with the paint. Allow it to dry and repeat this step until it is the shade you desire. For me that was about two, well applied, coats. Matt and I chose a deep, warm red to go along with the color scheme we chose for the kitchen. Pull off the masking tape and reapply a fresh set of tape on the opposite side of the barrier you created. 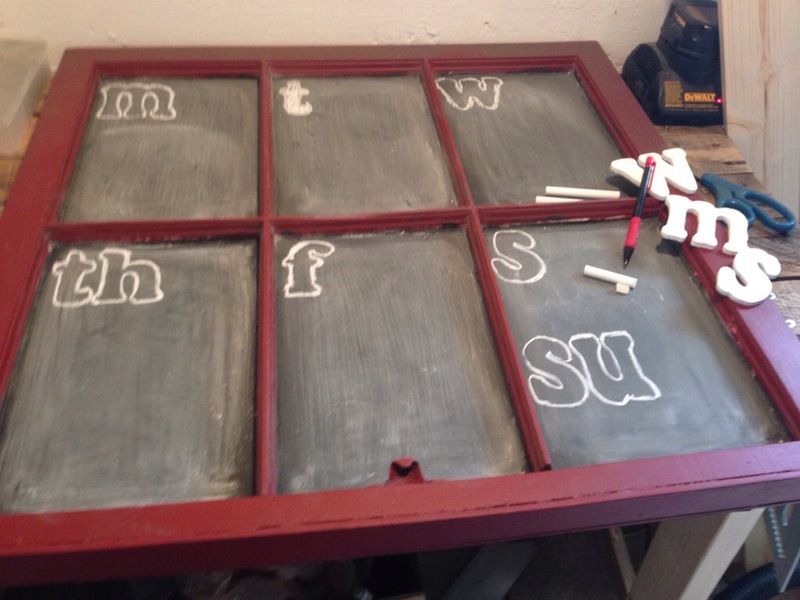 Now take your homemade chalkboard paint, which you can find directions to make here, and using the thin painting brush apply the chalkboard paint to each window panes edges. Then once you have created a even edge of paint use the thick paint brush to go back a fill in the rest of the window panes surface. Make sure you have previously rinsed out and allowed the thick brush to dry before painting with it. Allow chalkboard paint to dry and apply as many coats as necessary to achieve the desired shade of color. Peel off the masking tape from the panes edges. Ready to be written on! 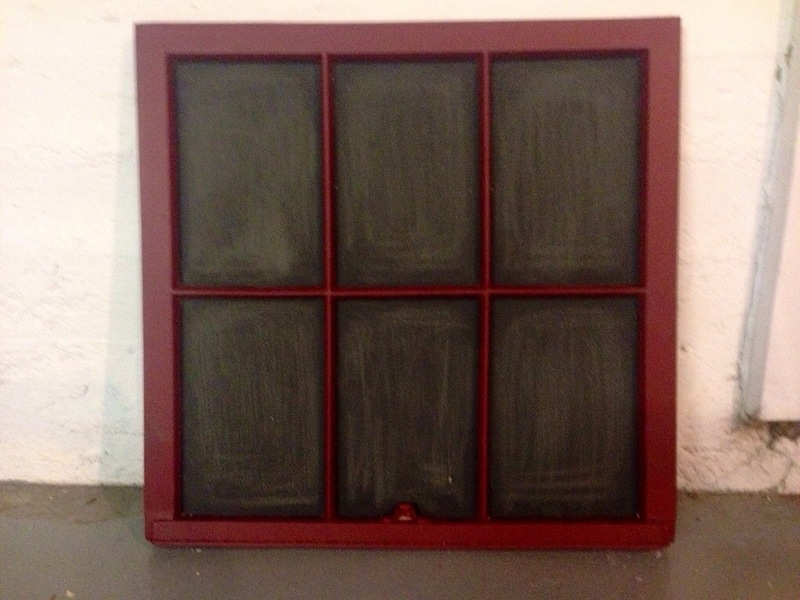 Now take the sand paper and sand the chalkboard paint pane down until it is smooth. Season the Chalkboard paint by rubbing chalk over the surface and wiping it off. Now you are ready to write on the board! Begin by taking the wooden block letters and using them as a stencil to outline with a pencil. Once you have done this trace over the letters with chalk. Now take the picture hanger set and have your handy husband apply it to the back of the frame. Lastly decide together as a family what you will be enjoying during dinner as you share in the joy of one anothers company. 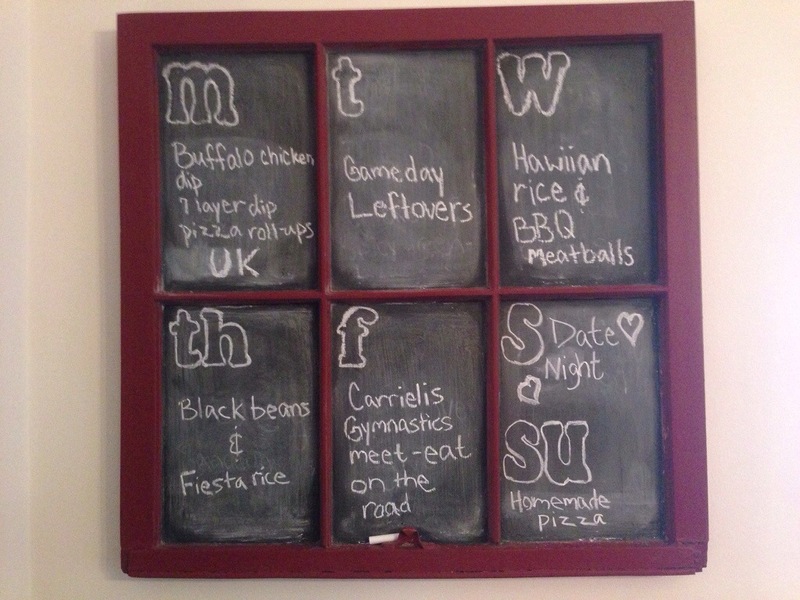 Using chalk write it down in the squares under the appropriate letter dictating the day of the week that specific meal will be made and hang it up in a visible spot for all to see! Final product being used for the exact reason it was repurposed! On a side not if you choose to make this menu board it can be a little time consuming, so have patience, take it one step at a time, and remember there is always tomorrow. I hope this post inspires you to begin crafting for the greater good and enjoyment of your family!